This article outlines these potential complications and their main treatments. Heart disease is a term used to describe a number of diseases that affect the heart. These diseases include arrhythmias (heart rhythm problems), heart infections, congenital heart defects (heart problems from birth), and blood vessel problems like coronary artery disease. Heart disease - particularly heart disease that narrows or blocks blood vessels - can lead to heart attack, angina (chest pain), and stroke. What's the link between heart disease and rheumatoid arthritis? Research has shown that people with rheumatoid arthritis are not likely to live as long as others. Rheumatoid arthritis patients also have a higher risk of death. Heart disease is largely to blame for the high death rates among rheumatoid arthritis patients. Doctors are unclear about how rheumatoid arthritis increases the risk of heart disease. Many researchers believe that inflammation - which causes rheumatoid arthritis - is also responsible for heart disease. 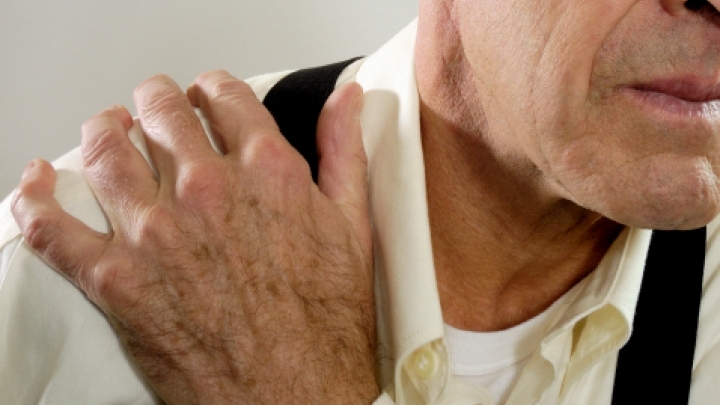 Chest pain or discomfort, also called angina, is the most common symptom of heart disease. This pain happens when your heart does not get enough blood or oxygen. Making healthy lifestyle choices is the best way to prevent and treat heart disease. If you have rheumatoid arthritis, stay active and eat heart-healthy foods to protect yourself from heart disease. A healthy diet and regular exercise can treat heart disease just as it treats rheumatoid arthritis. If you develop heart disease and lifestyle changes are not enough, your doctor may prescribe medications to lower blood pressure or reduce cholesterol levels. If you spot any signs of heart disease, see your doctor immediately. Let your doctor know which medications you are taking for rheumatoid arthritis, as some heart disease drugs can interfere with these medications. Lung disease is a term used to describe any disease or condition that happens in the lungs or affects proper lung function. The three main types of lung disease include airway diseases, lung tissue diseases and lung circulation diseases. Airway diseases are diseases that block the tubes, or airways, that carry gases to the lungs. In most cases, airway diseases lead to narrowed or blocked airways. Examples of airway diseases include asthma, emphysema and chronic bronchitis. Lung tissue diseases can change the structure of lung tissue, making it harder for the lungs to take in oxygen and release carbon dioxide. Examples of lung tissue diseases include pulmonary fibrosis and sarcoidosis. Lung circulation diseases cause problems - such as clotting, scarring and inflammation - in the blood vessels, making it harder for the lungs to absorb oxygen and release carbon dioxide. What's the link between lung disease and rheumatoid arthritis? The inflammation caused by rheumatoid arthritis can lead to all types of lung disease. Inflammation can affect the lining of the lungs (pleurisy), which causes a sharp pain while breathing. When the lining of the lungs becomes inflamed, fluid also can build up around the lungs, causing shortness of breath. Rheumatoid arthritis is known to cause scarring inside the lungs. Lung scarring may cause shortness of breath, chronic dry cough, fatigue, weakness and a loss of appetite. Rheumatoid arthritis medications have been known also to cause lung problems. Methotrexate (sold as Rheumatrex and Trexall) is the most commonly used disease-modifying antirheumatic drug (DMARD) for rheumatoid arthritis. In some patients, methotrexate has been linked to lung damage. What are the signs and symptoms of lung disease? How is lung disease treated? Your treatment will depend on the type of lung disease you have. But because you have rheumatoid arthritis, the first goal may be to control inflammation, especially because inflammation is likely to blame for your lung condition. You may be prescribed inhaled medication that opens your airways. You may need to drain fluid around the lungs. Your doctor may prescribe other medications to reduce scarring. However, scarring cannot be reversed. So take action early by seeing your doctor as soon as you experience symptoms of lung disease. Early treatment can prevent and slow down damage. Although it is not common, vasculitis is a serious complication of rheumatoid arthritis. Vasculitis happens when the blood vessels become inflamed. The blood vessels may weaken, become larger, or narrow. These problems make it harder for blood to flow properly through the blood vessels. In some cases, blood flow may stop completely. What's the link between vasculitis and rheumatoid arthritis? Not all patients with rheumatoid arthritis are at risk of vasculitis. This blood flow problem most often happens to patients with severe long-term rheumatoid arthritis. Smoking is also associated with vasculitis in people with rheumatoid arthritis. What are the signs and symptoms of vasculitis? Vasculitis can affect the vessels that carry blood to and from the skin on the fingertips and around the nails. When this happens, patients may develop small pits in the fingertips, or painful and red sores around the nails. When larger blood vessels are involved, a larger painful rash can form on the legs. If the skin becomes very inflamed, ulcers can form, increasing the risk of infection. Vasculitis also can affect the nerves. Nerve damage can lead to loss of sensation, numbness, tingling and weakness or function loss of the hands or feet. Since vasculitis may be a sign of increased inflammation caused by rheumatoid arthritis, treating vasculitis often involves controlling rheumatoid arthritis. Drugs that reduce the joint pain and swelling of rheumatoid arthritis can also control symptoms of vasculitis. Sjögren's syndrome is an inflammatory condition that generally affects the tear and saliva glands. Although doctors and scientists do not know what causes Sjögren's syndrome, it is thought to be an autoimmune disorder, meaning the body's immune system mistakenly attacks its own healthy tissues. In patients with Sjögren's syndrome, the tear and saliva glands become inflamed. This inflammation causes decreased levels of tears and saliva, causing dry eyes and dry mouth. Research has suggested that some genetic factors and perhaps some viral infections put people at risk for Sjögren's syndrome. What's the link between Sjögren's syndrome and rheumatoid arthritis? Like most complications of rheumatoid arthritis, Sjögren's syndrome is the result of inflammation. In the case of Sjögren's syndrome, the inflammation spreads to the tear and saliva glands. About half of people with Sjögren's syndrome also have rheumatoid arthritis or a similar disease, such as lupus. What are the signs and symptoms of Sjögren's syndrome? Drugs used in the treatment of rheumatoid arthritis and lupus may also be used in some patients with Sjögren's syndrome. Plaquinel (hydroxychloroquine) may be used to relieve joint pain and reduce rash. Corticosteroids like Deltasone (prednisone) and immunosuppressive drugs - such as Rheumatrex (methotrexate), Imuran (azathioprine), Cellcept (mycophenolate), and Cytoxan (cyclophosphamide) - may be used in severe cases when patients are experiencing fever, rashes, abdominal pain, lung problems or kidney problems. As cavities and tooth loss can occur as the result of Sjögren's syndrome, patients should regularly see their dentist. If dry eyes are your problem, see an ophthalmologist (eye doctor) on a regular basis. An eye doctor can check for signs of corneal damage. People with anemia have low levels of hemoglobin - a protein in red blood cells that carries oxygen throughout the body. For some people, anemia is a short-term problem that can be fixed through a quick diet change. For others, anemia is a chronic condition and may be the result of another health problem, such as rheumatoid arthritis. In severe cases of anemia, patients may feel tired or have shortness of breath, making it hard to complete daily tasks. What's the link between anemia and rheumatoid arthritis? The most common problem for rheumatoid arthritis patients is joint pain and swelling. The second most common problem is anemia. In fact, research shows that as many as 60 percent of rheumatoid arthritis patients have anemia. The inflammation of rheumatoid arthritis is one cause of anemia. When tissue becomes inflamed, it can affect a variety of processes involved in carrying oxygen to organs and other tissues. Many rheumatoid arthritis patients develop anemia because they have iron deficiency (low levels of iron in the body). If you do not have enough iron, your body cannot make the hemoglobin that allows red blood cells to carry oxygen. As a result, you may develop anemia, leaving you tired and short of breath. Iron deficiency is often caused by menstrual bleeding, digestive tract bleeding or problems getting iron from inside the bone marrow into the red blood cells. Some rheumatoid arthritis drugs - specifically non-steroidal anti-inflammatory drugs (NSAIDs) and prednisone - have been shown to cause digestive tract bleeding. As such, they can play a role in anemia among rheumatoid arthritis patients. At first, anemia does not have obvious symptoms. If you have rheumatoid arthritis, the best way to find out if you are anemic is to talk with your doctor about your blood count and changes in hemoglobin. In many cases, patients may need only change their diet or take iron supplements to treat their anemia. Research has shown that certain medications are effective for reducing anemia in rheumatoid arthritis patients. Some of these drugs are used to treat rheumatoid arthritis, while others trigger the production of red blood cells. Osteoporosis is a condition that causes the bones to become thin and weak. That is, the bones become less dense, increasing the risk of fracture. Osteoporosis is the most common type of bone disease. It affects both men and women. However, in the United States, approximately one out of five women over the age of 50 suffer from osteoporosis. What's the link between osteoporosis and rheumatoid arthritis? According to research, people with rheumatoid arthritis have an increased risk of bone loss and fracture. The increased risk of osteoporosis among rheumatoid arthritis patients is due to many factors. First, glucocorticoid drugs used in the treatment of rheumatoid arthritis can cause bone loss. Inactivity is another cause of osteoporosis among arthritis patients. The pain and loss of function in rheumatoid arthritis can make it difficult for patients to stay active. Over time, inactivity can lead to bone loss. As bone loss is often strongest around joints most affected by rheumatoid arthritis, some researchers believe that osteoporosis may be directly caused by rheumatoid arthritis itself. What are the signs and symptoms of osteoporosis? hunched posture or kyphosis, which is also known as "dowager's hump"
Treating osteoporosis in people with rheumatoid arthritis is more or less the same as treating the condition in people without rheumatoid arthritis. Nutrition plays a key role in osteoporosis treatment. People with the condition, or those who are at risk, should eat foods with high amounts of calcium and vitamin D, such as low-fat dairy products; dark green, leafy vegetables; and calcium-fortified products. Physical activity is also an important part of fighting osteoporosis. Activities that make you work against gravity - such as walking, climbing stairs, weight training, and dancing - can help your bones become stronger. Infections occur when tiny microorganisms get into a body part or tissues. These microorganisms invade and multiply, causing damage to various tissues. Eventually, infection gives rise to disease symptoms. Infections are caused by a variety of microorganisms, including viruses, bacteria, prions and viroids. Larger parasites and fungi can also cause infections. The human body fights infections with the immune system, which usually triggers inflammation - a key characteristic of rheumatoid arthritis. What's the link between infection and rheumatoid arthritis? Infections are associated with rheumatoid arthritis in a couple ways. First, some studies have shown that certain drugs used to treat rheumatoid arthritis may increase the risk of infection. Specifically, biological agents - such as TNF inhibitors and IL-6 inhibitors - are associated with a serious risk of infections from bacteria, viruses and fungi. Second, rheumatoid arthritis patients have a higher risk of infections, regardless of the medication they are taking. Studies have shown high rates of infections complicating rheumatoid arthritis. Research has suggested that the increased risk of infection among arthritis patients may be due to the disease process itself. That is, the inflammation of rheumatoid arthritis may play a role in infection, or vice versa. The type of treatment you receive will depend on the type of microorganism that has caused your illness. Antibiotics are drugs used to treat bacterial infections. There are many specific kinds of antibiotics designed to fight specific classes of bacteria. Viral infections cannot be treated by antibiotics. Instead, antivirals are used. Some antiviral drugs have been developed, but many viruses are very difficult to treat. Such viruses include AIDS, herpes, hepatitis B, hepatitis C and the flu. What do I do if I'm experiencing complications of rheumatoid arthritis? If you start to experience symptoms associated with these complications of arthritis, talk to your doctor immediately. The sooner your doctor knows about a health problem, the sooner she can take action to control symptoms and prevent potentially life-threatening health problems. Mayo Clinic, "Rheumatoid Arthritis: Complications" U.S. National Library of Medicine, "Rheumatoid Arthritis" University of Maryland Medical Center, "Rheumatoid arthritis - Complications" Arthritis Foundation, "Rheumatoid Arthritis and Heart Disease" U.S. National Library of Medicine, "Coronary heart disease" MedlinePlus, "Lung disease" Mayo Clinic, "Can rheumatoid arthritis affect your lungs?" Cleveland Clinic, "Rheumatoid Vasculitis" American College of Rheumatology, "Sjögren's Syndrome" Anemia.org, "Handout: Anemia & Rheumatoid Arthritis" Mayo Clinic, "Iron deficiency anemia" U.S. National Library of Medicine, "Osteoporosis" NIH Osteoporosis and Related Bone Diseases National Resource Center, "What People with Rheumatoid Arthritis Need to Know about Osteoporosis"